At TISC, our members love to skate. And some love to race. W are fast. And seriously fit. Do you want to skate fast and get fit?? Join us. We’re serious about what we do! We’ll start the 2017 program on April 3rd. 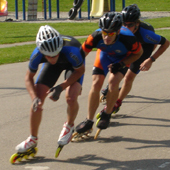 TISC will skate Mondays at the 400-meter track at Father Redmond and on Thursdays at the 200-meter track at Christ the King. TISC will be organizing at least two events. We are looking at running these with the first in early June and the second race in early to mid-July. More information to come later. All TISC membership applicants will be required to review and abide by the Equity, Climate, Governance, Mission Statement. And while you’re at it, check out this video- this is what some of us can do on skates! This entry was posted on Wednesday, March 1st, 2017 at 10:34 am and is filed under General. You can follow any responses to this entry through the RSS 2.0 feed. You can skip to the end and leave a response. Pinging is currently not allowed. Can we do a trial class before we decide if we want to join? Yes, first-time skaters can try one session for free. After that, skaters either must join the Club OR skate as a guest and pay $10 per session up to a maximum of 5 sessions at which point membership is mandatory. We would like to come April 17, we need rentals, what time should we come? I have just responded to your e-mail. Thank you.